how: Bus, East Delta Bus Co.
Hm. Not sure if I would do that again! Egyptian buses and driver… scary roads…. the only tourists….smoke…. not so ideal. Thankfully we met two nice tourists on the bus so we weren’t alone. 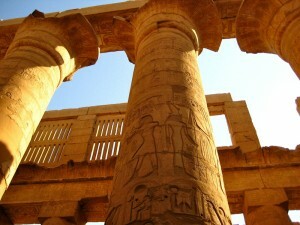 We arrived in Luxor the next morning and tell you the truth I wasn’t that impressed. The bus dropped us off outside of the city in what looked like just a little farm. It was so bizarre. Then we kind of haggled our way to a taxi ride on to our hostel, but in true Egyptian fashion, we were taken not to our hostel, but to a place close to it. We wandered the streets aimlessly. Then found our hostel down a very strange and ghetttto street! Welcome to Luxor. Luxor itself is a very poor city and doesn’t get half the tourism that Cairo receives (however does receive a substantial amount). It is separated into two parts, the west bank and the east bank. The city itself is filled with old temples, tombs, and museums. I sensed a different atmosphere here than in the other countries we had visited. I could smell, feel, and see it. And it was hot. I mean really really hot. We only had a day and a half in Luxor so we were determined to make the most of it. 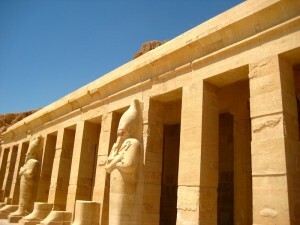 We headed to the Luxor Temple, Karnak Temple and the Luxor Museum straight away because we were headed to the Valley of the Kinds and Queens on the West bank, the next day. Everything was equally as impressive as the next I was only disappointed by the amount of dilapidation and lack of conservation of the structures. Either way it was somehow mystical and magical being among the Pharaohs…. the Egyptians…. one of the most intelligent and fascinating people of all time. The next day we headed to the West Bank. We rented a private taxi that morning for half a day and had gotten a decent price for it, especially because we split the price between the four of us (75 EGP). We saw everything that we could and I can’t say that one stop was better than another. However, if you are limited on time and money (you must a separate ticket for each place), I do recommend The Valley of the Kings, Dei al-Medina, Al-Deir Al-Bahari, and the Ramesseum Temple. That night we splurged a bit and had a nice meal in Luxor and enjoyed some pre-Ramadan celebrations in the town. We slept well that night and woke up to a wonderful breakfast provided by the hostel. It was quite gourmet and although the hostel wasn’t anything to cry home about, breakfast made up for it! We left around 2 that afternoon on another 11-hour bus ride up to Cairo. Whew. The last long bus ride of the trip. It saddens me a little.